DETROIT -- New technologies for autonomous, connected and electrified vehicles dominated the 2018 Automotive News PACE Awards Monday night, with Robert Bosch, Visteon and a dozen other suppliers recognized for moving the industry forward. Awards went to France's Valeo for a high-resolution laser scanner that detects road obstacles for the Audi A8, and to Magna Electronics for an artificial intelligence-based angle detection technology that lets Ford F-150 drivers back up a trailer without jackknifing. Suppliers including A123 Systems, BorgWarner, Continental, IEE and Toyoda Gosei picked up 15 PACE Awards here, including two claimed by branches of Valeo. Innovations in advanced safety, improved vehicle communications and lighter-weight parts and materials to support the drive to electrification snagged almost every 2018 award. The PACE Awards, now in their 24th year, are given for technology advances that have reached the commercial market. Winners are determined by a panel of independent judges from around the auto industry. 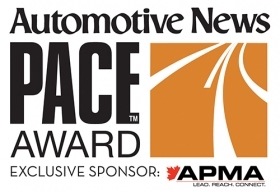 In addition to this year's 15 PACE Awards, selected after a review of 33 finalists, two 2018 Innovation Partnership awards went to Audi AG and General Motors for technology advances achieved by working with suppliers. Audi was awarded for its partnership with Continental on a safety domain control unit that combines passive and active safety management in a single controller. GM was awarded for its partnership with TK Holdings Inc. to develop a driver state system for the Cadillac CT6 that determines whether a driver is drowsy or distracted.